We, and especially Mary Katherine, have really enjoyed spaghetti squash recently. We’ve played with several fun applications of it – using it as a base for scallops and hanger steak or even having it as a stand-alone side. The resemblance to pasta is pretty remarkable – but it feels so much healthier because it’s squash. To be honest, our efforts with spaghetti squash have tasted great, but we really haven’t explored the pasta potential to its full extent. Ginny did some excellent research on Pinterest and found some awesome ideas. Spaghetti squash Mac N’ Cheese, for example. Or…. 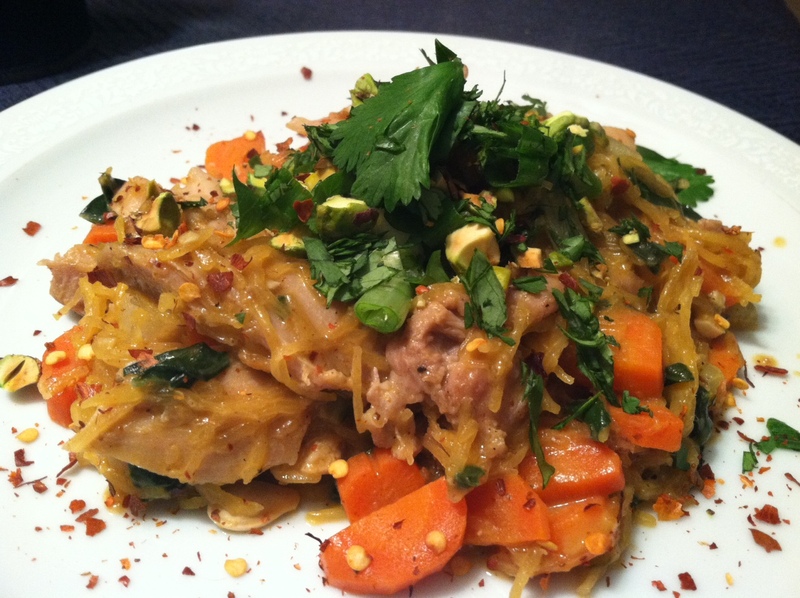 Spaghetti Squash Pad Thai! We made it tonight and thought it was delicious. Below is the original recipe that she found on Pinterest, but with some changes. We wanted to accentuate some classic pad thai flavors in the sauce, but play with the original even further. The original recipe called for un-seasoned and pre-cooked chicken breasts, an ingredient we took a stand against very early in our blogging days. It also omitted fish sauce, an ingredient in most pad thai recipes that we’ve seen, and a key source of savory goodness. Finally, we substituted pistachios in for peanuts as the garnish – something we thought was a fun twist on traditional pad thai. Let us know about your variations on this theme or other creative applications of ‘sgetti squash. Oh! What about ‘sgetti squash carbonara? Cut spaghetti squash in half lengthwise. Place on foil covered cookie sheet and season with salt and pepper. Roast at 375 degrees for about 45 minutes. Remove, let sit 5 minutes, remove the seeds and then “shred” the squash with a fork. After the squash has roasted for 20 minutes, season the chicken evenly with the salt/pepper/curry/chile powder. In a dutch oven/sauce pan, sear the chicken for about 3 minutes on each side. Transfer to a baking dish and cook in the oven until ready. Slice into pieces when complete. De-glaze the chicken pan with the wine, scraping up the fond. Add the vegetable oil and then sauté garlic, bok choy and carrots over medium heat for 5-7 minutes. Remove to a plate. Add chicken stock, peanut butter, soy sauce, rice vinegar and fish sauce. Heat until smooth. Return veggies to the pan, as well as the spaghetti squash. Add in chicken, and heat over medium heat for 5 minutes or until sauce has coated all. Divide among 2 plates/bowls and top with garnishes as desired. Enjoy! My family loves spaghetti squash! A few years ago my husband made a delicious pesto to toss in with the squash and some grilled shrimp. That was good stuff! Just stumbled upon your blog and I’m hoping to find some good Dinner Date Night ideas! We put the kids to bed (all 4 of them) and eat a romantic late night meal once a week. Would you mind if I feature one of your recipes, using my own photos of course, as long as I leave the proper links and credit?